If you’re interested in becoming an Exhibitor, Sponsor or Advertiser at the Amenity Conference 2019, then please give us your details to keep you informed! Early Bird Discount ends at midnight at the end of Friday 10th August, any bookings after this will be charged at full price. Booking options exclude VAT - Calculated VAT will be displayed on the summary page before payment. 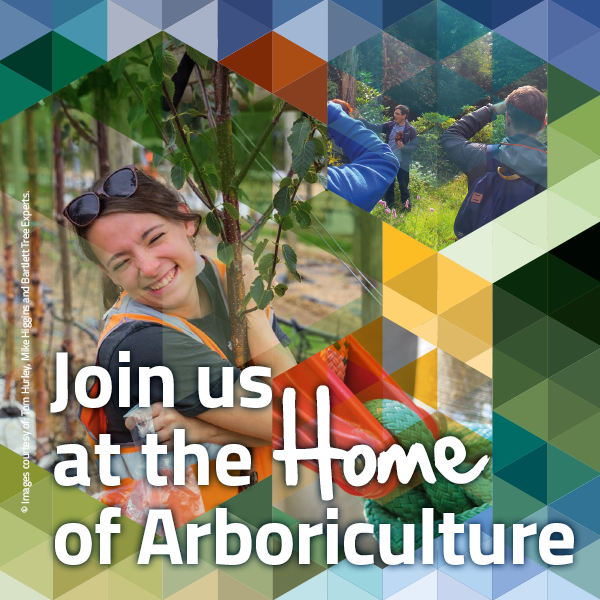 This year’s Conference is focussing on the heart of arboriculture – managing trees and tree populations, from the macro to the micro, through canopy and crown. Whether you are dealing with policy at local, regional, national or global level, or working on individual trees as a climbing arborist, consultant, specifier or practitioner, the conference will present an engaging programme of international and local speakers that will take your knowledge and understanding to new levels. Under the four broad topic areas of ‘Natural function’, ‘Governance, guidance and application’, ‘Pruning methodologies’ and ‘Challenging current practice’, we will explore in depth the latest understanding, theories, technologies and procedures while taking an honest look at past and present practices in order to help drive the industry towards a more enlightened approach to our day-to day relationship with the urban forest. Under the four broad topic areas of ‘Natural function’, ‘Governance, guidance and application’, ‘Pruning methodologies’ and ‘Challenging current practice’, we will explore in depth the latest understanding, theories, technologies and procedures while taking an honest look at past and present practices in order to help drive the industry towards a more enlightened approach to our day-to-day relationship with the urban forest. Morphophysiology is the discipline that links a tree’s architecture with its biological functioning, with reference to its energetic, hormonal and structural aspects. The form of a tree is the expression of the dynamic relationship that binds each tree to the environment in which it grows. The form a tree acquires, however, is not simply a reaction to its environment, but also relies on the adherence to principles of tree architecture development. We will illustrate how these principles change in relation to different species and how they evolve following the life of each individual tree. The relationship that links the crown architecture to the organisation of the root system will be presented and finally it will be shown how it is possible to relate the architectural characteristics of a tree to its biological, physiological and pathological aspects. Urban forest canopy targets are becoming increasingly common and are in some cases driving city policies and management. Cities across the world are aiming to achieve 20%, 30% or even 40% canopy cover. Using tree canopy cover as a key target for policy and management has several advantages. The use of clear canopy targets can assist in developing ambitious urban forestry programmes and generate public awareness and support. Canopy targets are clear and measurable, and thus are often popular with politicians. On the negative side, however, urban forest canopy information is less useful for some urban forest benefits, for example in relation to social and cultural values. This presentation will look at the current state of the use of canopy targets in urban forest governance and management in cities across the globe. It will take a critical look at how canopy targets inform better urban forestry and will provide suggestions for a more balanced use of these targets in governance, planning and management. Pruning removes mass and reduces bending in the wind on the pruned stem. However, little is known about the impacts of structural pruning which leaves some parts of the tree not pruned. This study was designed to measure change in stem and trunk strain in turbulent wind after a reduction in the length of one side of a codominant stem pair. Trees were placed in front of a storm simulator with airfoils directing 22m/s (50 mph) wind at four frequencies. Trees were subjected to 30 cycles at each f(a) at each of four pruning doses – 0%, 33%, 66%, and 100% foliage (and associated branch mass) removed from the smaller codominant stem. Reducing length by pruning one stem of a codominant stem pair reduced strain on the pruned stem and the trunk below the union in turbulent wind. Data suggests that structural pruning could reduce damage in a storm. The non-pruned stem of the codominant pair experienced no strain change in wind following reduction or removal of the competing codominant stem. Challenging current practice Philip van Wassenaer Ontario, Canada Reduce the crown, retain the tree An understanding of tree morphology and natural tree survival strategies can inform management approaches for aging trees. Statics Integrated Assessments or tree pulling tests are used to determine the uprooting or breaking safety of mature trees with compromised root systems or significant stem decay. These assessments are also used to prescribe pruning approaches to retain troubled trees. Many mature trees have structural constraints that are not correctable in one pruning application. These trees can, however, be improved over time, utilising crown reduction and thinning techniques. Large pruning wounds can lead to significant decay and structural weakness but if too little is cut, the tree may break, also causing large wounds. How do we find the appropriate dose? How do we determine the right level of pruning? The techniques used for maintaining aging trees can also be applied to younger trees and trees damaged by storms. The timetable of speakers and topics is expected to become available towards the end of April, so be sure to visit the website to be kept informed. Delegate booking will open in May.